No, really – where to begin? That’s the whole point behind this month’s Mixology Monday, hosted by Pink Lady and her bevy of shaker-wielding cohorts at LUPEC-Boston, who have chosen as the theme The First Time. OK, stop sniggering and/or blushing, and for god’s sake don’t start pounding out the damn Foreigner song — oops, too late; the focus this round is on drinks you’d introduce to a cocktail neophyte (one whom you’d like to turn into a cocktail regular). There are a number of drinks in the playbook that I think are great introductions to the world of cocktails. Some, such as the daiquiri, have been mentioned by other bloggers already this round (thanks a hell of a lot for snagging my original plan, Stevi), whereas others have been on this blog for ages: I think the Southside is a great introduction to gin (especially if you splash a little champagne on top, a la a French 75, which is also a good choice), and I have yet to introduce anyone to an Old Cuban who hasn’t come away craving another one. While it’s tempting to aim for something extremely basic, I think that would ultimately miss the point of this exercise: to not only introduce someone to a cocktail that is inoffensive and easy to swallow, but to introduce them to the whole concept of a well-made drink and help them understand why freaks like us spend so much time reading, writing and mixing these things (not to mention drinking them). For this, I think you need to give them a glimpse of the delicate complexity inherent in a well-made cocktail without steamrollering them under a wave of Campari, Chartreuse or rye whiskey — ingredients that are indispensable to any drink geek’s liquor cabinet, but that can take a little getting used to. In addition to the drinks listed above, here’s another that I’ve seen turn curious drinkers into dedicated fans, and that has several major points in its favor: the Corpse Reviver #2. * THE NAME – sure, it’s old hat to cocktail fiends, but pretty much everyone does a double-take upon hearing the name for the first time; it sounds kinda cool, and it’s near-impossible to forget. Add to the name the interesting (yet short and approachable) backstory that manages to not only tell something about the drink but about the early days of cocktail culture, and you’ve got a nice, concise package of mixological history to send home with your cocktail novice. * THE RECIPE – it’s equal parts of four ingredients, plus a single drop of another. In other words, it’s almost as easy to remember as the name (though Lillet may take a little explanation), which means your cocktail novice can repeat it back to other bartenders (those who haven’t already been introduced to it, that is), or can try to replicate the drink at home. Plus, in terms of construction, it’s just measure, shake & strain. Then smile. * oh yeah, THE FLAVOR – the CR#2 is simultaneously straightforward and complex. Yes, it has gin, but as long as you don’t pummel your initiate with an aggressive gin or something cheap and harsh, it’s doubtful even ginophobes will have much of a problem with it. Then, the classic interplay between fresh citrus and Cointreau, and finally the Lillet – slightly orangey, mildly sweet (and yes, without the bitter bite of the original Kina Lillet or of preferred but totally unavailable alternatives, but you might want to hold off until a future cocktail session before totally geeking out on the poor newbie). Finally, the absinthe — granted, this is the ingredient that’s most likely to cause your novice to rebel, but I like to follow Ted Haigh’s suggestion of using a single drop (okay, maybe two) — it’s enough to season the drink and give it depth and complexity, but not enough to introduce an assertive anise (or any other) characteristic to the finished cocktail. Overall it’s a good balance of sweet and sour, with enough complexity to make it interesting but not so much to overwhelm the first-timer’s palate. After an initial torrid affair with the CR#2 a few years back, right around the time Vintage Spirits and Forgotten Cocktails first came out, I’ve moved on to other things, only coming back to this drink on occasion. That’s too bad — it really is a nice little number, worth breaking out from time to time, especially if you’ve got a cocktail-curious friend coming over and you want to give them a quick and agreeable introduction to your world. Considering that Doc’s book is being revamped and republished this summer, it’s high time to start sampling them again. Combine ingredients in a cocktail shaker and fill with ice. Shake well for 10 seconds, strain into chilled cocktail glass. Garnish with a cherry, should the mood hit. 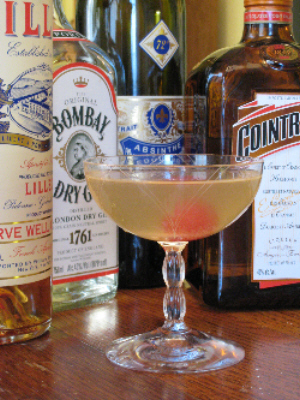 So there, I finally blogged about the Corpse Reviver No. 2 – about damn time. Head on over to LUPEC-Boston in the next day or two to see what others have been up to this round of Mixology Monday. ← The Green Hour Returns! Why, you are quite welcome, Paul. I also love this drink, being one of the myriad who’ve blogged about it before, but I still contend that the CR#2 is more suitable (perhaps one of the most suitable) as that drink that gets a casual cocktail drinker to make the jump to cocktail THINKER. It certainly was one of two or three cocktails that performed that function for me. But if you waved a drink at me seven years ago with gin and absinthe for crying out loud, I’d have bolted. Zane Harris of Vessel and Spur recently made me a CR#2 that seemed a notch above. His secret ingredient: peach bitters.